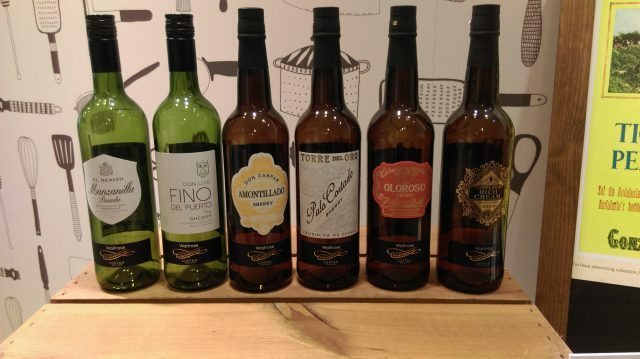 Waitrose has beefed up its Sherry range amid its wider summer refresh, redesigning its top-tier own label Sherries to bring more on-shelf appeal. The new look bottles, which will go on promotion from 17 May, have abandoned the colour-coordinated, coherent look across the range to embrace more individual styles and emulate the older style of premium Sherry to create a more up-market look. More modern styles such a Waitrose Don Luis Fion del Puerto, which fortified buyer Nick Room said was proving popular with younger consumers as an aperitif, had a more modern look. All of the sherries in the own-label range are dry, apart from the Waitrose Tomás Abad Cream Sherry, which Room says taps into the on-trend trend of Sherry paired with food. “The on-trade has pushed premium Sherry, which tends to be a more of a dry style rather than sweet one, as they go well so tapas, and there is more interest than there has been in Spanish cuisine,” he said. “It’s a category that hasn’t enjoyed the best of days, but nevertheless it is one that the Waitrose customers feel an affinity to it and sales have been better than the market for some time, so we want to capitalise on that and make sure we keep the interest going and help customers to be educated in drinking fine Sherry,” fortified buyer Nick Room said. As part of the revamp, Waitrose had added a new Waitrose El Benito Manzanilla Passada from Sanlucar de Barrameda into 67 stores (RRP: £9.99), which acts as a “benchmark” of the style, as well as a Tio Pepe En Rama (RRP: £15.00) which goes in 20 stores from 29 May. The move comes as part of a wider refresh for summer, which has seen around 90 new lines go on shelf in total, as well as 11 new craft beers and six spirits. Around 14 of the new wines have been added exclusively to Waitrose Cellar. New introductions in-store include a number of wines from the Rhône, comprising two fine wines, Le Relais du Roi, Châteauneuf-du-Pape (RRP: £20.99),Coeur de Rochevine, Saint-Joseph 2013 (RRP: £28.99) and two mid-priced wines, a Remy Ferbras Ventoux 2016 (RRP: £7.99) and Gabriel Meffre Saint-François (RRP: £9.49). James Bone, buying manager (wines) said that there had been a renewed strategy to provide greater choice within the fine wine range, and the introduction of frequently refreshed, limited quantities rotating parcels forming an important plank of the strategy that had led to very successful sales on Italian fine wines in particular. This spring, the retailer has added Château Durfort-Vivens, Margaux 2ème Grand Cru Classé 2008 (RRP: £65), from Bordeaux into 131 stores as well as a Coeur de Rochevine, Saint-Joseph 2013 (RRP: £28.99). This was part of its move to introduced more of a “ladder” to help people shop the fixture wines, and find different wines. “Last year we looked at Fine Wine and it was getting condensed in terms of price and needed more of a ladder,” Bone said, added that it had started with Italy and moved into the “heartland of Burgundy”. “Now there is more of a ladder which makes it more exciting for customers to find different wines at different price points and an opportunity to trade up because those below it become more attractive to consumers,” he explained. “We are also put some higher priced wines in deeper distribution and have looked at the results to see how we can optimise our fine wines and give it lots of space.” He points to new stores such as Haywards Heath and Kings Cross which have the fine wine fixture as a centre part to the department, to draw the customer in. “We invest in it and in the theatre, which is part of it,” he said. More premium California has also seen a refresh, with four new whites, ranging from £8.99 – 18.99, and four whites, while additions have been made to Italy, with four new red wines, ranging from a Moramari Montepulciano (RRP: £5.99) to a Piccini Brunello di Montalcino Riserva at £29.99, and Australia, which has four new higher priced reds and one white wine.